Dentists, doctors, and other business owners can slash their tax bill and funnel huge savings into tax-advantaged retirement vehicles with planning. This is a time-sensitive tax tactic that you might optimally want to implement before the end of this year. To illustrate how it works, consider a dentist in her peak earnings years, with $500,000 of income. She's married and her children are out of the house. She is in the 35% federal tax bracket, biting deep into her income. A potent antidote is establishing a federally tax advantaged defined benefit in her practice or joining with her partners in one. Money she salts away into qualified retirement plans is subtracted from her taxable income, reducing her tax bill for this year, and it enables her to manage her tax bracket to optimum advantage. Defined benefit (DB) plans have been qualified under the federal tax code for special treatment for decades, but they are not nearly as popular as defined contribution (DC) plans. Because your contribution is defined — but not your retirement benefit — DC plans pose less financial risk to employers and are much more popular with large companies. Guaranteeing a defined benefit on a retirement plan is riskier, so Uncle Sam imposes much higher contributions and more elaborate rules on a DB plan than on a DC plan. In 2018, the maximum contribution to a DB plan is $220,000 versus $55,000 for a DC plan. If our dentist has a DC plan already but now adds a DB plan, she could reduce her taxable income by as much as $275,000! However, socking away so much would make it impossible to meet her current expenses, so she will need to reduce the amount she contributes while optimizing it for maximum income tax savings. 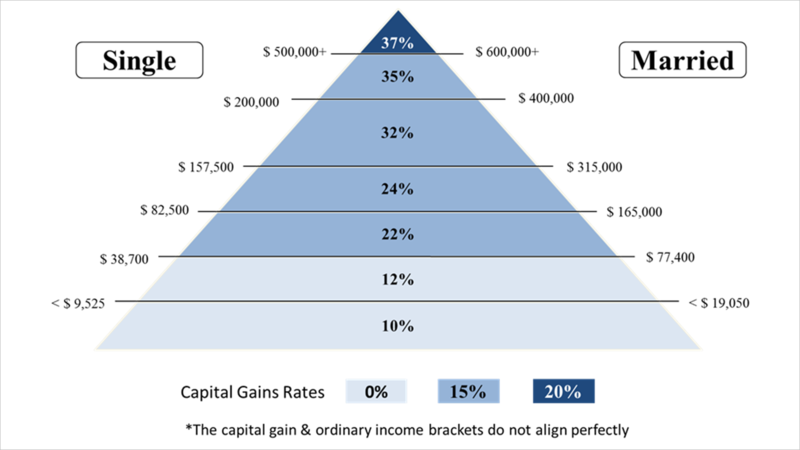 Our dentist could put $185,000 into the retirement accounts, for instance, just enough to reduce her taxable income to $315,000 and putting her in the 24% tax bracket instead of the 35%. And because the dentist is a partner in the business, she also qualifies for a 20% deduction under the Sec. 199 (A) of the new tax code for owners of small business that are S corps, LLCs, sole proprietorships, or other pass-through entities. To get this extra tax break, her taxable income must not exceed $315,000 for a married couple ($157,500 for a single). Twenty percent of $315,000 works out to a deduction of $63,000, placing her taxable income at $252,000, firmly in the middle of the 24% bracket. The taxes are a lot lighter than if she hadn't taken steps to whittle down that half a million in income, and she has socked away a large defined benefit for retirement. Setting up a defined benefit plan requires expert help and careful planning but is a great tactic to consider this year, especially because of 20% tax deduction.